Trends are something that it is worth keeping an eye on when you run an online casino site, that’s why you will often see a few months go by where a variety of different casino sites pop up with a similar theme because that particular concept is ‘hot’ with the general public at the time. This becomes even more apparent when there is a trend in the online casino market itself. However, the popularity of slots has been rising and rising for so long now that it can barely but referred to as a trend anymore, but that doesn’t mean that there isn’t an increasing number of sites that focus on slot games in their names. 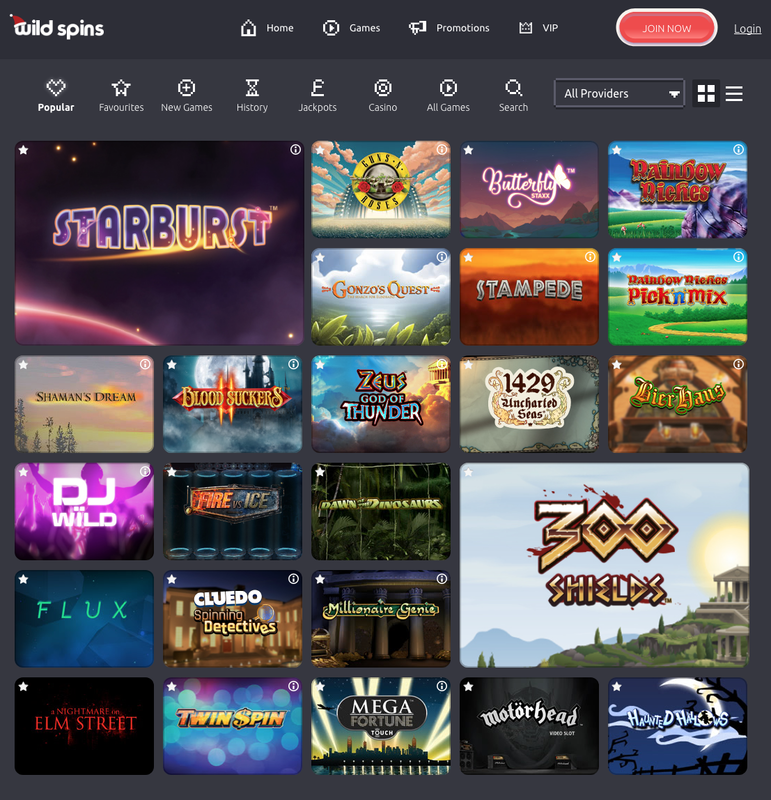 Enter Wild Spins, launched in 2016 amongst a host of other sites with the words ‘Slots’ or ‘Spins’ included within their title. Like many of its competitors, Wild Spins doesn’t actually only focus on slot games, which makes the title a little misleading, but there is fairly common for such sites which should lessen the possibility for confusion. So, how does Wild Spins match up to its slot focused competitors, and to other online casino sites as a whole? With a name like Wild Spins, you may be expecting an adrenalin fuelled design concept full of bold images, bright colours, and epic animations. If this is what you are looking to find, then Wild Spins is going to be something of an anti-climax for you. Because the word ‘Wild’ in this case seems to mean pastel covers and a subtle design theme. That isn’t to say this site isn’t attractive, in fact it looks quite lovely, but one can’t help but feel like one was led to expect a very different site to the one that exists. Navigation is simple here, with the ability to scroll through thumbnails of many popular games on the homepage, which you can then access with one-click. This is a popular tool for new sites, but you’ll struggle to find anywhere that’s it is as well executed as it is at Wild Spins. Categories and sections are clearly marked as well, so you should not have any issue finding the part of the site you are looking for. This isn’t the most impressive design, and it certainly doesn’t match the title, but it is quite pleasant to look at, and that goes a fair way to making a site tempting to players. Titles here come from a wide range of different software developers, with 888, Eyecon, IGT Interactive, NetEnt, NYX Gaming, OpenBet, PariPlay, SG Gaming, and Williams Interactive providing the games that are on offer. This mix of providers means a wide variety of different games are on offer. Obviously, the focus here is on slots, hence the title. You’ll get choices that include new releases from 2016, like Aloha! Cluster Pays, Guns ‘n’ Roses, and more, with classic titles also being here in abundance, include Fluffy Favourites, Rainbow Riches, Starburst, and a host of other old favourites as well as some jackpot games. As mentioned previously, it isn’t all about slots here, and you’ll find a fair collection of table and card games on offer as well, ranging from roulette and video poker, to baccarat and keno. There’s a fair selection of promotions here to keep you interested too. Essentially, Wild Spins may not be the most exciting site you come across, but it is consistently good, which is hard to find. So, if you’re looking for the online casino equivalent of a safe pair of hands, then Wild Spins may well be the choice for you.